Continuing our Vince Gironda interest, today features an article written by the man himself on what separates the men from the champions in Bodybuilding. The answer may just surprise you. I have stated numerous times that champions obviously possess something that others do not. Even though training partners do the same routine set for set, rep for rep, they do not obtain the benefits of the champions. I have observed champions train in a manner I do not approve, but they receive results that are phenomenal. What is it that they possess? Well, I will tell you, they are using mental suggestion (self-hypnosis). When I first observed this, it puzzled me. The first time I noticed Walt Baptiste, former gym owner and magazine publisher from San Francisco (Body Moderne), touching his abdominals while backstage before going out to pose at several physique contests, he seemed to be saying something to his abdominals as he stroked them. He seemed to be sending a message into this body section, because I could actually see the abs sharpen up and grow more outlined than his normal condition. I later discovered that Walt was sending mental images to his subconscious, to produce this phenomena. I learned that you can actually produce the desired condition by picturing in your mind what you wish to manifest. He also breathed deeply and regularly in through his nose and out through his pursed lips. As you know, this type of breathing is employed between sets prior to repeating the next set. At this time, the mechanism employed should be to picture in your mind a clear image of the muscle or area of the body you wish to develop, and hold the image throughout the performance of that set. 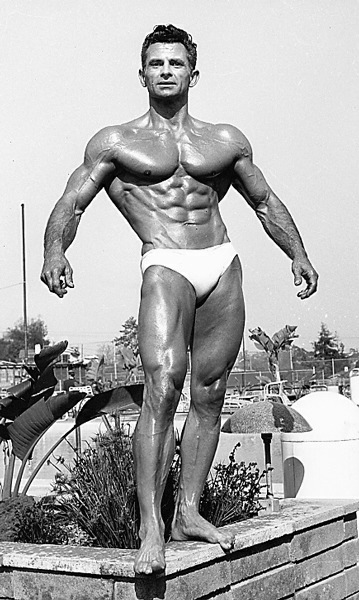 Walt promoted the first Mr. California Physique Contests, in which I placed second and third several times. He later gave up his gym and opened a chain of yoga studios in the San Francisco area. The technique of mental suggestion is what all physical culture writers are trying to explain when they throw that nebulous term “concentration” at you. They seem to recognize that concentration is necessary, but do not know how to trigger the mechanism that produces the phenomenon. The subconscious believes any thought you perceive, and stores it. It accepts everything that is thought or spoken by you or another, if you accept it as truth. But it must be repeated again and again until the subconscious accepts it as fact. Then it will produce the condition pictured in your mind. This procedure is what I maintain is used by the champions, whether or not they are aware of it. They are convinced of a successful outcome. This awareness is more important that any steroid drug, any diet plan or supplement, or any exercise routine ever conceived. I have observed bodybuilders who take steroids and receive no benefits. They take unimaginable amounts of supplements and constantly try new routines, but are not getting results, and never will until they discover that what I have written here is the true essence of bodybuilding. For years I have been asked by my fans to write the secrets of the champions, and here you have it.